Awaken Recovery Center had relied on its website as its primary form of marketing. However, many prospective clients requested a brochure. 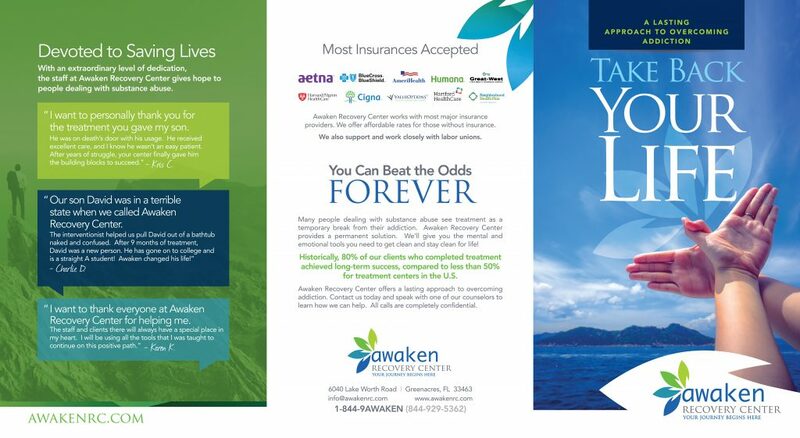 Additionally, various professionals in the recovery industry who had the potential to refer clients to Awaken had been asking for brochures they could give out. The owners of Awaken contacted Susan Greene for assistance in creating a brochure. 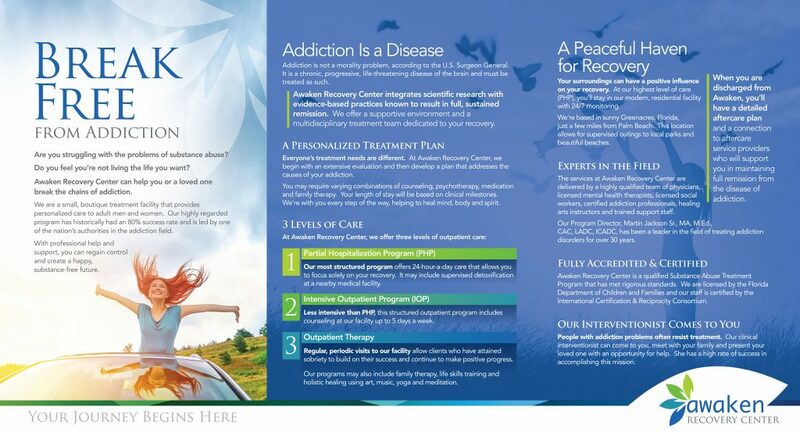 Working with a graphic designer, Susan created a tri-fold brochure that was visually appealing and described in detail all that Awaken Recovery Center had to offer. The client wanted the copywriting to convey that Awaken wasn’t just a place to deal with substance abuse temporarily. It offered a lasting approach to overcoming addiction. Additionally, Awaken wanted clients to know that it would customize treatment to their needs. Susan explained in her copy that the facility offers three levels of care — partial hospitalization, intensive outpatient, and outpatient therapy. Lastly, Awaken wanted to be sure that the brochure spoke not only to the person with an addiction but also to their families, who might be involved in choosing the right treatment facility for their loved one. The brochure was well-received by prospective clients and referral sources. It has been an effective marketing tool in helping Awaken Recovery Center expand its reach. Today, the facility continues to grow and help more clients break free of their addiction. Could your business benefit from additional exposure and referrals by using a brochure? Contact Susan Greene to get a professional brochure.